Get RELIEF for your family, now! Vive equips families with the experience and understanding they need to heal. Vive Family Intensives provides transformational family therapy through short-term, intensive family experiences. Vive addresses the root cause of what keeps families stuck in dysfunctional patterns by surrounding the family with an exceptional amount of support that includes between 5-10 days of family therapy that include state-of-the-art clinical interventions, neurotherapies, canine-assisted therapy, and experiential exercises. Vive family intensive has not only demonstrated effectiveness in improving young people’s self-concept, anxiety, depression, and shame but has been characterized as providing the healing effects of six months of therapy in only one to two weeks. At Vive our specialty is getting to the root of the pain caused by developmental trauma, which is often complicated by relinquishment, poor self-concept, maladaptive behaviors, and PTSD. Vive offers 5 or 10 day, individualized, family therapy Intensives. The family therapy intensive provides clinical emersion and trauma integration including family therapy, assessment, neurofeedback, canine therapy, and treatment planning that optimizes healing. Vive uses evidence-based, holistic therapies in a much more intensive and targeted way to achieve accelerated results. Families dealing with issues related to early trauma such as depression, anxiety, difficult interpersonal relationships, and substance abuse can experience remarkable benefits starting in the first session. What is Family Therapy? And why does Vive use it? Vive selected family therapy as our primary modality because we firmly believe that parents need to be the safe and secure base for their child, not the therapist. Our mission is to create a “safe CASA” within the family, so that communication becomes the primary means to work through issues, versus holding each other in contempt, giving the silent treatment, slamming doors, etc. Family therapy focuses on creating a healthy family system, strengthening the parental dyad, improving appropriate communication, solidifying boundaries and limits, and helping to create emotional and physical safety within the context of the family, all while exploring the child’s developmental trauma that is impacting their life and their family. The developmental framework that we use is called CASA, Commitment, Acceptance, Security, and Attunement. We begin with Commitment on the caregivers part. For us, that is the parent, guardian, or primary attachment figure which commits to working as a family to further their better understanding of one another. That Commitment needs to be coupled with Acceptance. Acceptance by the parent and by us as caregivers can be a complicated process, but at its fundamental level, it is a recognition that developmental trauma and attachment insecurity is driving the student’s behavior. We have to accept that it is not a matter of trying harder for our students, but of experiencing how to trust others and ultimately themselves. Our students are inherently valuable. We need to see them as always doing their best. Once our students feel accepted, they can begin to feel Secure, or Safe, both physically and emotionally. The caregiver needs to be a Secure relationship. Security is defined by predictability, consistency, reliability, regulation, and empathy along with established boundaries and clear limit setting. 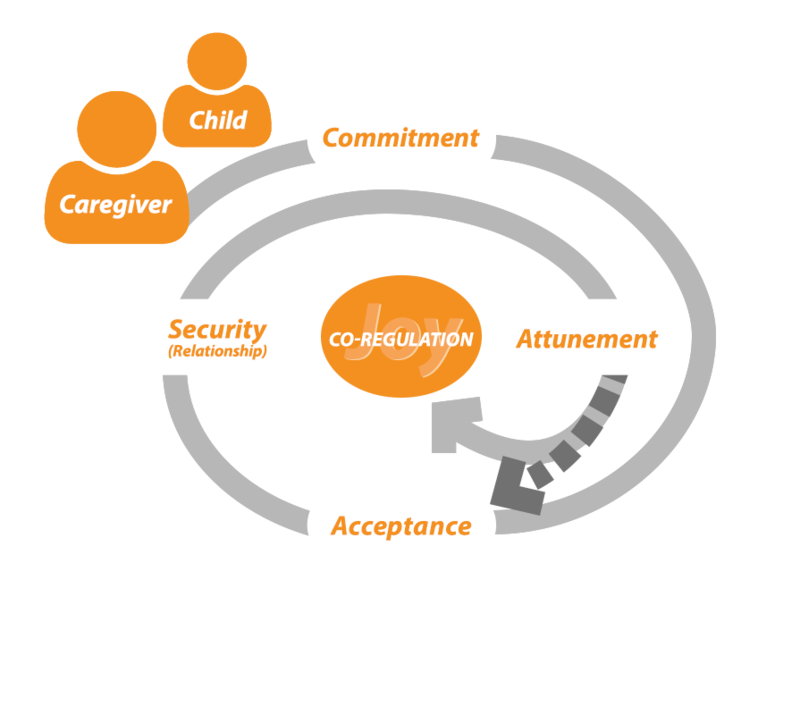 The goal of our model is co-regulation, an emotional state in which our students can safely learn from adults and eventually from peers. Co-regulation is not a steady state. Our students will move along the cycle of commitment, acceptance, security, and attunement frequently as they encounter new experiences or re-experience some aspect of their previous traumatic history. So, while attunement is the lever for co-regulation, the ground upon which the lever sits is commitment, acceptance, and safety. At any moment of dysregulation, as caregivers, we have to go back through our model to check that we are committed, accepting and providing safety before we can accurately attune. “I actually think it could have been more days. The time was emotionally tough but I feel like it could have been one additional day or even two to allow a deeper exploration. It wasn’t until the second day that I felt I had finally gotten the “hang” of what we were doing there. Vive has experience dealing with a variety of behavioral and emotional challenges. Using a Family Systems approach, Vive provides two clinicians, both with masters or doctorate degrees in the mental health field. Vive believes working with the individual client, the client’s family members, and the family system as a whole is essential to the healing process.